When can a wrong answer be better than a right one? When the unintended effects turned out to be even better than the intended effects that weren’t achieved! 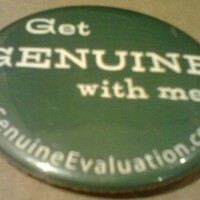 Recently we’ve noticed that, not surprisingly, some people have been confused about the difference between genuine, real, and better evaluation. Let’s clear that up. The blog you’re currently reading and a set of principles that underpin our work. And maybe one day a book. As evaluators, we all love the notion of evidence-based policy, don’t we? So what could possibly be better than this stunning example – reblogged from Carl Maxim’s site – of how to implement it in practice? Britain’s first hospital built entirely on the power of suggestion is to be opened next week as a cost-effective solution to the rising price of healthcare. The Royal London Placebo is totally fabricated, offers no actual treatments and will be manned entirely by extras from TV shows such as Casualty and Holby City. In evaluation it is always important to ensure not just that the facts are reported correctly, but that the key messages are also accurate.